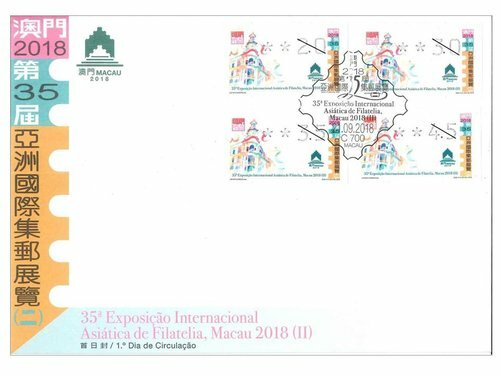 The highly anticipated “Macao 2018 – 35th Asian International Stamp Exhibition” will be held at The Venetian Macao Cotai Expo Hall A from 21st to 24th September, 2018, symbolises a great leap in Macao’s philatelic history. 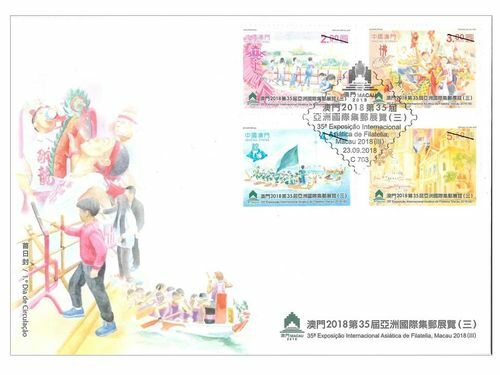 The exhibition also promotes Macao’s connection and exchange with the world in the publicity and inheritance of the philatelic culture, showing Macao as an ideal platform for convention and business tourism. 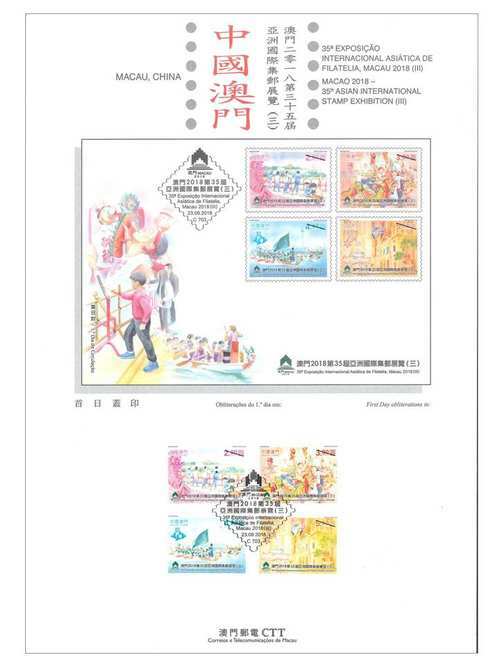 To commemorate the grand Asian international philatelic event, Macao Post and Telecommunications Bureau launched three sets of stamp issues featuring this exhibition. 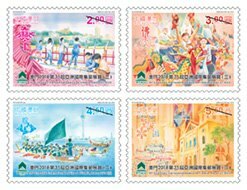 The first set was issued on 1st March, 2018, depicting the streets and alleys of Macao as well as its famous gourmet to display the local attractions and traditions. 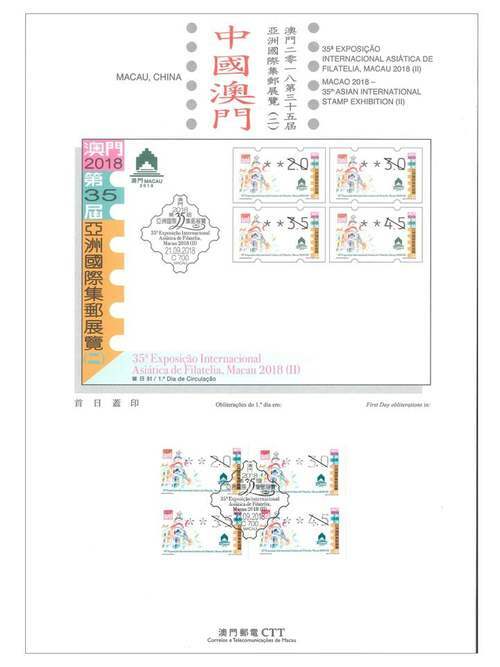 The second set is the label stamp and will be issued on 21st September, 2018, the opening day of the Exhibition. The printing quantity is 1,500,000 label stamps. 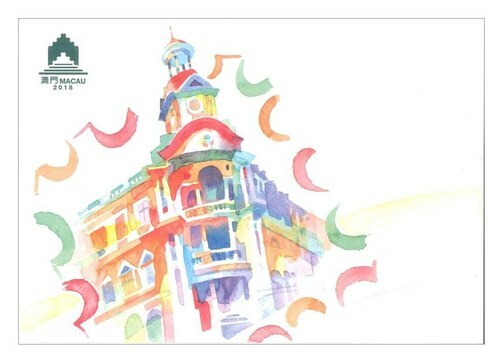 The design of this label stamp pictures the CTT Macao Headquarters’ Building with masterful strokes and gives it a new look by using bold colors that lends a special touch. 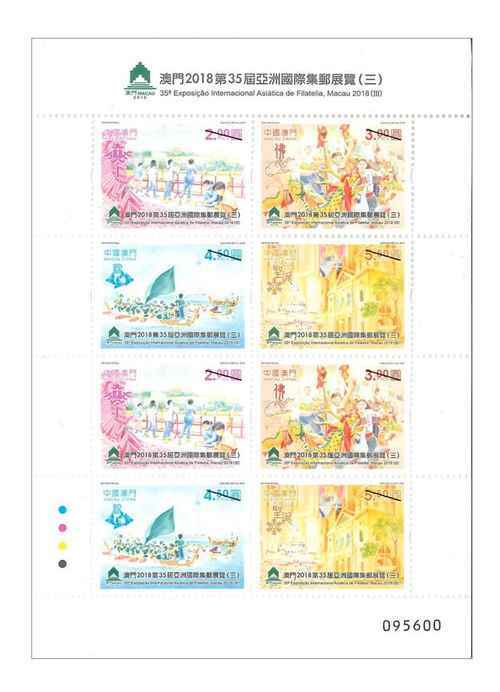 In recent years, label stamps have been particularly popular with philatelists. 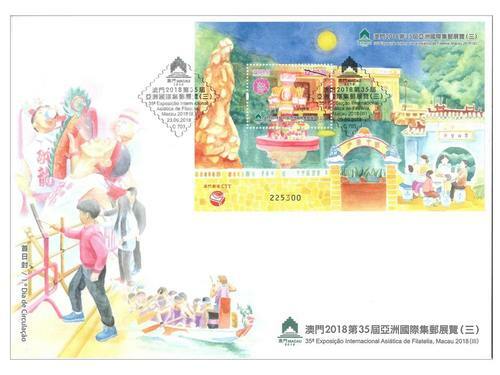 Whenever label stamps are issued, they can always attract enthusiasts queuing up in front of the automatic stamp vending machines, eager to enrich their collection. 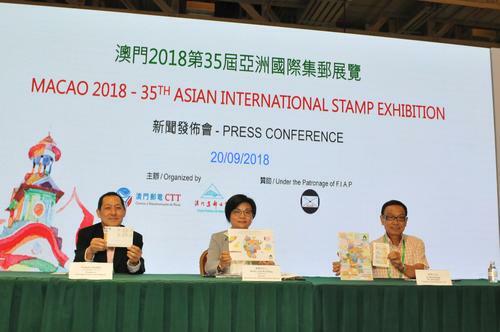 This new issue of label stamp will surely start a new craze among collectors, especially attracting the members of the automatic label stamp associations from different regions of the Mainland. 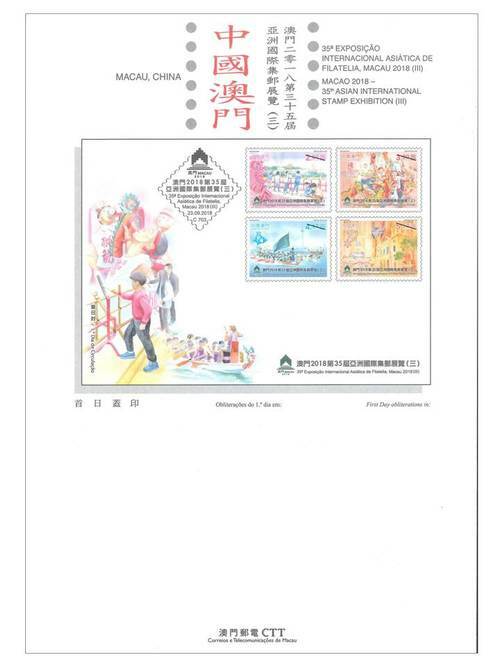 The stamp designer of this label stamp is Mr. Lio Man Cheong, and the text of the information brochure is written by Macao Post and Telecommunications Bureau. 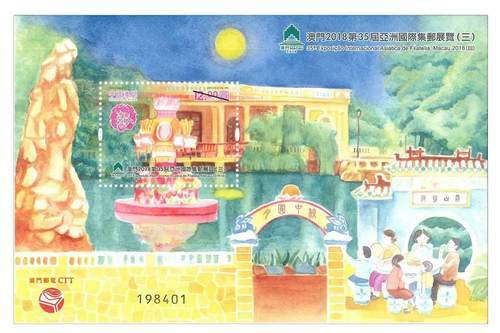 The third set will be issued on 23rd September, 2018, the eve of the Mid-Autumn Festival. 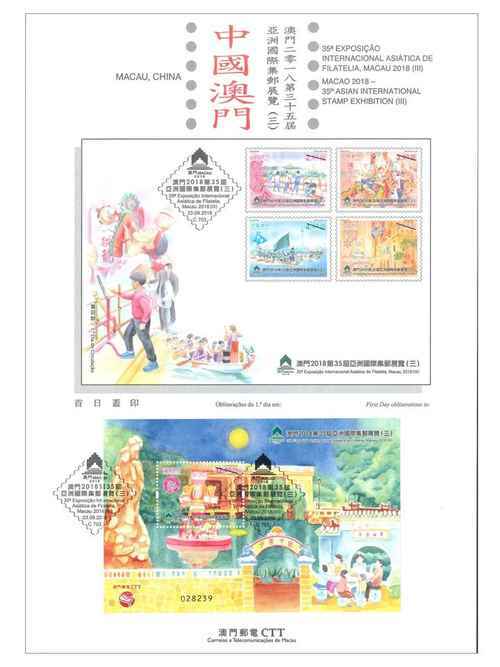 This issue includes a set of four stamps and one souvenir sheet, the stamps are highlight the joyfulness and liveliness of the festival by depicting its celebrations and locations. 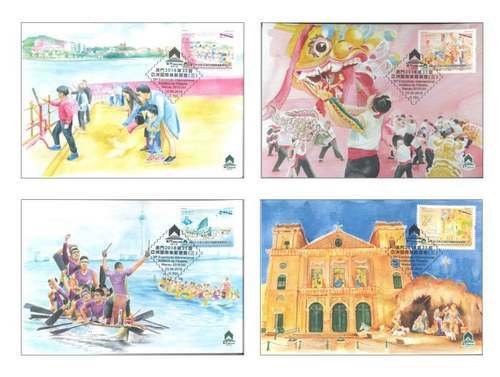 This set of stamps, through the delicate brushwork, vividly portrays the festivity of firecrackers burning in Macao during the Lunar New Year, the exuberance of drunken dragon dancing on the Buddha’s Birthday, the dedication in dragon boat racing during the Dragon Boat Festival, the solemnity of the Christmas Mass in Sé Cathedral, and the blissfulness of family gatherings and moon watching during the Mid-Autumn Festival in Lou Lim Ioc Garden. 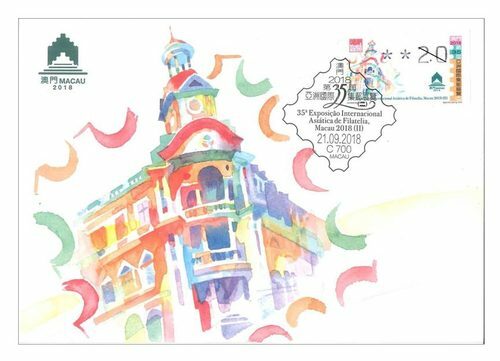 Philatelists and exhibit-goers from around the world can experience Macao’s festive events and cultural charm from these little squares of stamps, feeling the affability of the small city in Macao. This is the eighth theme in 2018. 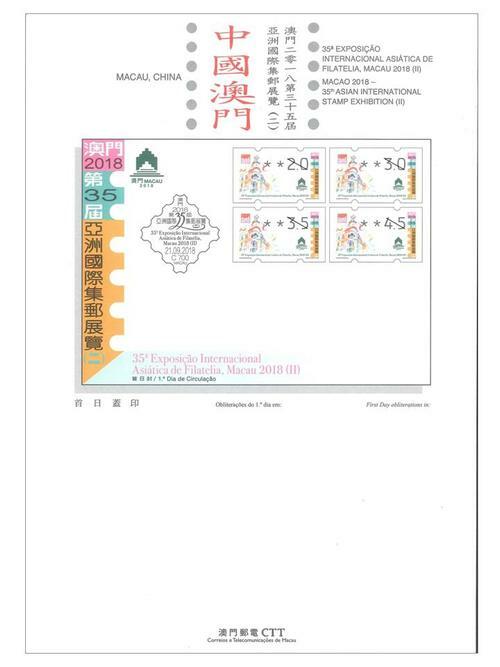 The previous issued stamps are “Lunar Year of the Dog” on 05/01/2018, the label stamp “Lunar Year of the Dog” on 31/01/2018, “Macao 2018 – 35th Asian International Stamp Exhibition (I)” on 01/03/2018, “Mainland Scenery VII” on 12/04/2018, “Classic Fables and Tales” on 30/05/2018, “Joy” on 26/06/2018, “Chapas Sínicas (Chinese Documents)” on 06/07/2018, “Masters of Chinese Literature – Tang Xianzu” on 27/07/2018, and “60th Anniversary of the Publication of Macao Daily News” on 15/08/2018. - General Post Office, from 9:00a.m. to 5:30p.m. - Communications Museum, from 9:00a.m. to 5:30p.m. - The Venetian Macao Cotai Expo Hall A, from 10:00a.m. to 7:00p.m. - Rua do Campo Post Office, from 9:00a.m. to 7:00p.m. - Maritime Ferry Terminal Post Office, from 11:00a.m. to 6:00p.m. - Airport Post Office, from 10:00a.m. to 7:00p.m. 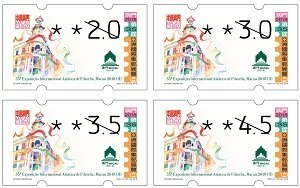 On the issue date, the maximum sales quota per queuing customer is 20 sets of label stamps, 5 first day covers with label stamps, 5 information brochures with label stamps and 3 maximum cards. 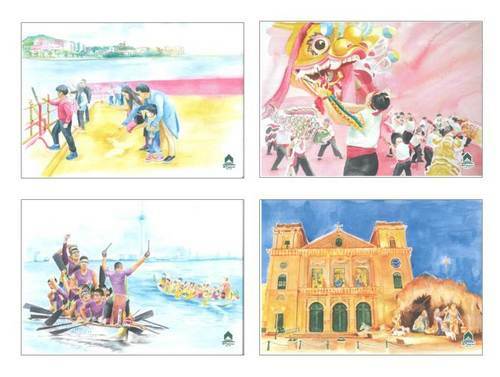 - The Venetian Macao Cotai Expo Hall A, from 10:00a.m. to 6:00p.m.